Sometimes when I look at the posts in my blog reader list, I shake my head in disbelief as to what is happening in this crazy, corrupt, and vile world. It seems like so many of the evil perpetrators are not being caught, arrested, tried, and jailed as would be the case in a “perfect world.” Jesus told us that “in this world, you (we) will have trouble.” Jesus never minced words and told the utmost truth in all circumstances. That is why I believe in Him and follow Him. He is the Living Word and the Bible is the written Word of God. When the news of the day gets REALLY crazy, I’m so glad that God gave us the ability to have a sense of humor. It is a kind of relief from many of the cares and troubles of this world. It is funny to see the faces of people who have, and are, trying to undermine the American people in a swamp, circling the drain. What is not funny is the realization of the terrible things they believe in, have done, and continue to do that hurt everyday Americans. As a Christian conservative woman, I understand that people like this hate me, hate my beliefs, hate my advocacy for Jesus Christ and God’s Word, the Bible; and attempt to do everything they can to diminish me and those like me. The derogatory phrase, “those who cling to their guns, Bibles, and religion” comes to mind. Now, this one is funny because the fake news “dossier” that we now know that HiLIARy and Podesta devised and paid for, and the minions in the media of mass deception (who all cried when she lost the election and may even scream at the sky once again as the anniversary of the date of her loss approaches), put forth lie after lie after lie over the past 11 months in order to make it appear that President Trump colluded with Russia. It ended up backfiring…big time! It just blew up in her face. Fellowship of the Minds: New Amazon service gives contractors a key to your house for deliveries. Then, even after having a few laughs, the reality of this fallen world creeps in yet again. I was going to list some here but all one needs to do is to type in any evil proclivity into a search engine and you will get a disgusting eyeful of evidence. I often write about the topic of “a woman’s right to choose” (code word for acceptance of abortion) at this blog. Choose Life, Your Mother Did! When someone tells me that I have “no right to tell women what to do with their own bodies” (which is code word for allowance and acceptance for abortion) and claims that it’s not “evil,” “abhorrent,” “murder of a baby in the womb,” etc. ; what they are doing is actually advocating for their own fleshly beliefs and desires. Even some Christians are guilty of this! They see this particular idea and definition of “choice” as more important than LIFE, as well as that new spirit that has been created within them by God through being born again in Jesus Christ. It is a war within between the flesh and the spirit. God creates within us a new spirit, a new man, a new nature, born in His image, in the likeness of the Spirit of God. He gives us new desires. He gives us a hunger for righteousness and holiness and a longing to please our Heavenly Father. Through the power of the Holy Spirit who comes to dwell within us, the Comforter sent by God helps alongside and empowers our new man to walk after and seek after those things which are right. However, we still dwell in the same old fleshly body with the same old sin nature. And therein lies the war. The joy of having the Lord in my life is most important, precisely because every other type of happiness proceeds from it. It’s not a “positive sentence” [like a typical mantra from man], it is manna from heaven because it is a promise from God. [Self-control] is a battle that begins in our minds. Our minds as well as our hearts need to be focused on God and His Word. Daily Bible reading is the one habit that will make you happier–and holier–every day. The Bible contains all the information needed for life’s challenges. Its words provide strategies for every situation we face. They are life-changing and life-giving. God’s promises are never-failing, and His truths are infallibly reliable. Our enemy is that old deceiver and liar, the devil. But he works with two associates to tempt us and keep us from the victory. These companions of the devil in his endeavors are the world and the flesh. That is why the Bible tells us in 1 Peter that the devil goes about as a “roaring lion” seeking “whom he may devour”. This is done by understanding the way that the devil uses the world and flesh together to deceive us and draw us into sin and iniquity. The enemy’s goal is to wound us to the point of losing hope and faith, so that we give up and our sins become presumptuous to the point that we are unable to be used of God. The years, even decades worth of corruption that surrounds the Clinton crime family, Obummer, the DNC, and the Podestas is truly sickening. I hope and pray that more information gets out there (despite the refusal of the media of mass deception to report it) via Fox News, conservative websites, and blogs so that the evil of these people FINALLY sees the light of day. Hillary Clinton likes to laugh off the Uranium One scandal as a ‘debunked’ right-wing conspiracy, however; internal emails show the Clinton camp was panicking as the conservative media revealed the dirty details of pay-to-play. Wikileaks leaked a Podesta email dated 4/29/2015 with the subject line “It’s out there”. 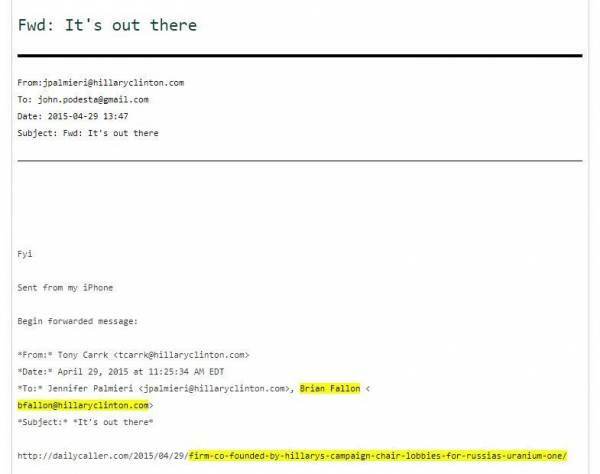 (screenshot below) The original email from Tony Carrk (Hillary’s research director) to Jennifer Palmieri (Hillary’s director of communications) and Brian Fallon (CNN hack and Hillary’s press secretary) linked to a Daily Caller article titled, “Firm Co-Founded By Hillary’s Campaign Chair Lobbies For Russia’s Uranium One”. The Daily Caller article was then forwarded to then-campaign chairman John Podesta with an “FYI”. Many more could be listed here, but I’m pressed for time today. Outwit Infinite Wisdom and Countermine Providence Itself? Kingsjester’s blog is one of my favorites because his posts are very informative and his analyses of what is truly going on in the “hearts of men” are spot on. Soros Gives $18 Billion to His Open Society Institute to Fund Special Interest Groups Including “The Resistance” does not disappoint, and serves as a warning regarding the evil resistance that Soros continues to perpetuate against our Constitutional Republic. When I returned from babysitting my sweet almost-2-years-old granddaughter yesterday evening, my husband asked me if I heard about the $18 billion dollar donation that the evil billionaire “donated” to his Open Society Institute. I told him that I heard of it, but didn’t know the details yet. Kingsjester’s blog gave me the needed details to share in this post. Note, Those that willfully persist in sin consider not the power of God’s anger. (1.) Virtue and piety are good, for they are light and sweet, they are pleasant and right; but sin and wickedness are evil; they are darkness, all the fruit of ignorance and mistake, and will be bitterness in the latter end. (2.) Those do a great deal of wrong to God, and religion, and conscience, to their own souls, and to the souls of others, who misrepresent these, and put false colours upon them-who call drunkenness good fellowship, and covetousness good husbandry, and, when they persecute the people of God, think they do him good service-and, on the other hand, who call seriousness ill-nature, and sober singularity ill-breeding, who say all manner of evil falsely concerning the ways of godliness, and do what they can to form in men’s minds prejudices against them, and this in defiance of evidence as plain and convincing as that of sense, by which we distinguish, beyond contradiction, between light and darkness, and between that which to the taste is sweet and that which is bitter. 4. Who though they are guilty of such gross mistakes as these have a great opinion of their own judgments, and value themselves mightily upon their understanding (v. 21): They are wise in their own eyes; they think themselves able to disprove and baffle the reproofs and convictions of God’s word, and to evade and elude both the searches and the reaches of his judgments; they think they can outwit Infinite Wisdom and countermine Providence itself. Or it may be taken more generally: God resists the proud, those particularly who are conceited of their own wisdom and lean to their own understanding; such must become fools, that they may be truly wise, or else, at their end they shall appear to be fools before all the world. Hat tip: Kingsjester’s Blog, Blue Letter Bible, and graphics page links. I love to read the encounters that Jesus had with individuals in Matthew 9. What He said back to them contains many examples of priceless wisdom. What is interesting to note, is the fact that the “multitudes” had a very positive reaction to this, whereas the ‘scribes’ accused Jesus of blasphemy. Now when the multitudes saw it, they marveled[fn] and glorified God, who had given such power to men. Jesus’ answer to them was epic! All of the continuing turmoil that is going on here in America, as well as around the world can be very discouraging. Hurricanes causing death and destruction, flooding damaging homes, electricity taken away for weeks or months, wildfires in Northern California engulfing over 3,500 homes, the horrible shooting at an open air concert in Las Vegas that killed 48 people and injured 500 others, the threats of nuclear war with North Korea and the ongoing attack of global radical Islamic Jihad! Adding to the misery are those “hidden culprits” in government (a.k.a. “The Deep State”) and the media of mass deception that continually lies to the public and puts forth propaganda in order to push forward their own evil agenda. Such awful events can cause heartache, depression, hopelessness; loss of joy in this life, discouragement and no peace. From the Christian perspective, the truth is that we will never have peace in the world until individuals have peace with God. The only way to have peace with God is to repent and confess our sins at the foot of the cross of Jesus Christ, ask for forgiveness, and welcome the Holy Spirit into our hearts for the salvation of our souls. During this time of hatred often being spewed against Christians, conservatives, white people etc. by groups whose goal is to demonize those of us with such beliefs and characteristics; it can be hard to witness to them about Jesus Christ. Many just don’t want to hear it! They have put up their hearts of stone against any conversation that they don’t agree with and/or hate, and therefore refuse to listen or even discuss the issues calmly. 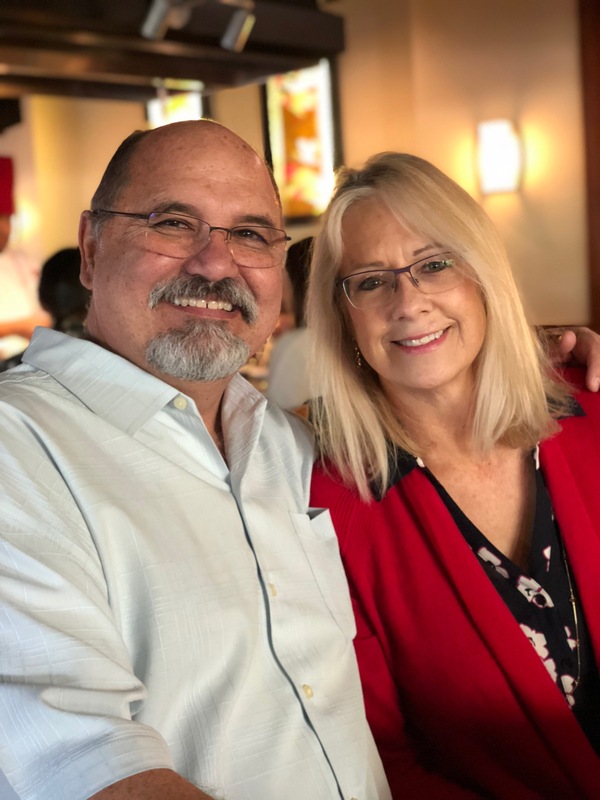 It is often my prayer that people who are searching for answers would find this blog and read something here that would help them to at least consider Jesus Christ and encourage them to read the Bible. After all, the Bible is the best selling book of all time! Here are some quotes from people who have prayed and asked for supernatural help in loving those who seem “un-lovable” at times; that also helped to remind themselves of all the blessings in life. Footage of Stephen Paddock at an Anti-Trump Protest? 3 Updates! Searching for answers? 10/4/17 Further updates in comment section! ! I am putting this link up top because it is THE most important update! Citizen Wells: Mandalay Bay suspect 4th floor video and police report reference, Video authentic? Be SURE to watch the video! In the video, there is footage of a woman who was driving by the Mandalay Bay Resort Hotel at the time of the shooting. She caught, on her cellphone video camera, both video and audio evidence of machine gun shots coming from a 4th floor window of the hotel! In fact, I am embedding the video here because the person sharing the video wants it shared EVERYWHERE! Like everyone else, I am going through the stages of grief over this horrific act of evil. People are searching for reasons why this happened and exactly what really did happen; who is truly responsible for it, the motive for doing this and why it could not have been prevented. Sadly, like everyone else who is grieving, I don’t have the answers to all of those exact questions. However, I do have a post written by Albert Mohler that I think EVERYONE needs to read! Evil points to a necessary moral judgment made by a moral authority greater than we are — a transcendent and supernatural moral authority: God. Only the Christian worldview, based in the Bible, can explain why moral facts exist. Today, most Americans awoke to news from Las Vegas that is nothing less than horrific. For so many in Las Vegas, Sunday night must have seemed like the night that would never end. In the face of such overwhelming news, we naturally seek after facts. We want to know what happened, and when. We want to know who did it. By mid-morning the facts were staggering. More than fifty people are dead and hundreds wounded after a lone gunman opened fire on a music festival from a perch in a hotel room 32 floors above. The attack was deadly, diabolical, and premeditated. In Las Vegas and beyond, hundreds of families are crushed by grief and concern. More than fifty human beings, very much alive just hours ago, are now dead, seemingly murdered by random order. The facts will continue to come as investigations continue. We need facts in order to steady our minds and grapple with understanding. We must have facts, and yet we can be easily overwhelmed by them. Some “facts” will not be facts at all. National Public Radio helpfully and honestly ended its news coverage of the massacre with these words: “This is a developing story. Some things that get reported by the media will later turn out to be wrong. We will focus on reports from police officials and other authorities. We will update as the situation develops.” I count that as both helpful and honest. But the facts of who and what and where and how, still unfolding, point to the even more difficult question — why? Why would anyone kill a fellow human being? Why launch an ambush massacre upon concertgoers listening to country music? Why premeditate a mass killing? Was he driven by some obsession, fueled by some grievance? Was he sending a signal or political message as an act of terrorism? Is the answer psychiatric or pharmacological? Our minds crave an answer. We cannot help but ask why because, made in God’s image, we are moral creatures who cannot grasp or understand the world around us without moral categories. We are moral creatures inhabiting a moral universe and our moral sense of meaning is the faculty most perplexed when overwhelmed by horror and grief. The terror group known as ISIS or the Islamic State claimed that Stephen Paddock was a “lone wolf” attacker who had recently converted to Islam. Law enforcement authorities said there is no evidence of anything related to ISIS or Islam. So far as we now know, Paddock left no note and communicated no clear message. The gunfire tells some story, but we do not yet know what the story is. We may never know. That troubles us, and so it should. Knowing the story and determining the motivation would add rationality to our understanding, but we will never really understand. A massacre by a lone gunman killed 32 people at Virginia Tech in 2007. Another killed 27, mostly children, at Sandy Hook Elementary School in 2012. Yet another killed 49 people at the Pulse nightclub in Orlando in 2016. We really do not fully understand any of these attacks, nor countless other outbreaks of evil around the world. One of the main theological insights about evil is that it is so often absurd. It is ultimately inexplicable, unfathomable, and cannot be resolved by human means. That is exactly how a president should speak, and underlining the “act of pure evil” as evil is exactly how a morally sane person should think. The judgment of evil here, real evil, should be beyond dispute. Evil is a fact, too. And evil is a theological category. The secular worldview cannot use the word with coherence or sense. The acknowledgement of evil requires the affirmation of a moral judgment and a moral reality above human judgment. If we are just accidental beings in an accidental universe, nothing can really be evil. Evil points to a necessary moral judgment made by a moral authority greater than we are — a transcendent and supernatural moral authority: God. That’s truly frightening, but McBrayer argues that by the time students arrive at college, they have already been told over and over again that there are no moral facts — that nothing is objectively right or wrong. Only the Christian worldview, based in the Bible, can explain why moral facts exist, and how we can know them. Only the biblical worldview explains why sinful humanity commits such horrible moral wrongs. The Christian worldview also promises that God will bring about a final act of moral judgment that will be the final word on right and wrong — as facts, not merely speculation. The Gospel of Christ points us to the only way of rescue from the fact of our own evil and guilt. Our hearts break for the families and communities now grieving, and we pray for them and for those even now fighting for life. It is both telling and reassuring that secular people, faced with moral horror as we see now in Las Vegas, can still speak of evil as a moral fact — even if they continue to deny moral facts in the classrooms and courtrooms. No one can deny that the horror in Las Vegas came about by an act that was evil, pure evil, and evil as a fact. I learned about the horrific Las Vegas shooting at the country western music festival outside the Mandalay hotel at 1:00 a.m. this morning. Awakening at that time and unable to go back to sleep right away, I turned on the news. Oh no…not again! This time, the details of the attack were so awful and evil, I could not even bear to watch the details. As grief overcame me, I sent up prayers for the victims, their families, the responders and for our nation as a whole. There is too much hatred, sin, evil and death as a result of people who ratchet up anger, spur on such deadly events, and then push into madness those who are sick, satanic and uncontrollable… like this perp to do such evil and cause so much death, injury and carnage against innocent people who were just attending a concert! The Last Refuge has a post up with many details. Earlier, I started searching for additional online accounts of this terrorist attack (yes…it is terrorism!!!) and found The Gateway Pundit’s coverage. 1. The Facebook and Twitter accounts of the shooter were deleted. 2. Information was being shared about the shooter and his girlfriend, who some were saying was “out of the country” at the time. 3. The shooter had an arsenal of weapons in the hotel room. 4. Did the shooter act alone? How did he get all those weapons, undetected, up to the room by himself? 5. The shooter was a recent convert to Islam. 6. The shooter was an anti-Trump demonstrator. I could go on and on with a list of suppositions and information being shared by many commenters. However, with our current media of mass deception at work continually, will we ever know the facts and truth? One comment over at “Gateway Pundit” contained a video that could possibly show that the shooter was a rabid anti-Trump demonstrator. The video owner is asking for more videos of this perp’s possible appearances at other anti-Trump protests where a high resolution photograph might be found. UPDATE 10/3/17! The above video link has since been removed. Why am I not surprised? Here is another one. Perhaps YouTube can’t shut them down fast enough, but hopefully readers here will be able to view this new one. Found another video that shows Paddock in a pink hat, wearing a pink “NASA” shirt at an anti-Trump rally. Regardless of what Buzzfeed would have you believe, video evidence proves that Stephen Paddock was politically active. The question we all need to ask is why are leftist news organizations trying to hide this evidence? Las Vegas shooter Stephen Paddock anti-trump? This video was just sent to the FBI so I guess we’ll know if this was him soon enough. They got much better resources than I do. The resolution of these videos are not clear enough to say for sure, so what we all need to do to find out for ourselves is search facebook, google, and twitter for the Reno Trump Protest 2017 and see if we can find a high resolution picture with this man who is wearing a pink hat and a pink nasa shirt. You may upload this video to anywhere you want, use it in any media, etc, you do not need my permission I’m not doing this for personal recognition, I’m doing this to figure out why 250 people were shot for no reason. 1. Shooter didn’t know how to use an automatic weapon. If you listen he didn’t use bursting trigger pulls. If it is a M-16 or AK type you would use a 3 round burst trigger pull. From what it sounded like to me is that it is a crew served weapon like an M-60. Those machine guns work best with a 6-9 round burst. If you listen you can hear it loosing gas pressure as the cyclic rate of fire slowed. The pauses were most likely switching weapons or un- jamming the weapon. 2. How did this untrained idiot get his hands on a fully automatic weapon? ATF has rules on these. 3. “Girl friend is Indonesian. Largest Muslim nation in the world. Those are just a couple of quick observations. Having operated an M-60…that ain’t one !!! And all our M-16’s had a “FUN” switch, not a BURST mode. Better comment is “WHERE did he get an Automatic” ??? YouTube Video: President Trump Gives Remarks; Words of Comfort and Healing. When horrible incidents like this happen, I often turn to the Bible for words of TRUTH and comfort!